What happens when a man with a death wish finds something to live for? 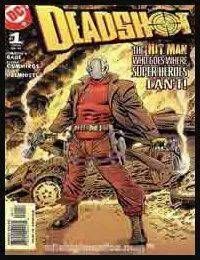 Deadshot, an expert marksman and cold, efficient killer, believes he has no reason to live...until he learns he has a daughter! When he discovers shes living in a neighborhood plagued by violence, he decides to clean up the area, by any means necessary! Part film noir and part classic Western, Deadshot tells the story of a violent man who must take on local mobs, corrupt cops, and even a former Suicide Squad member to give his daughter a life of peace and security.